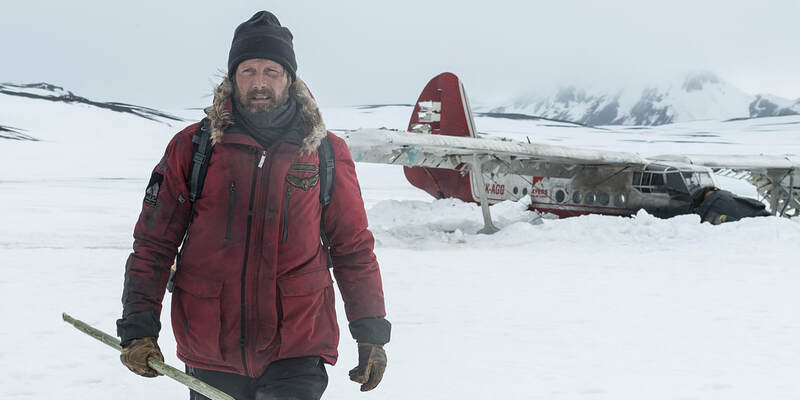 THE STORY - A man stranded in the Arctic after an airplane crash must decide whether to remain in the relative safety of his makeshift camp or to embark on a deadly trek through the unknown in hopes of making it out alive. THE GOOD - Mads Mikkelsen delivers a physically commanding performance that earns our emotion and our sympathy. Brutal storytelling with glimmers of hope from Writer/director Joe Penna. THE BAD - We've seen survival stories like this before. No characterization. ​​​​We’ve seen survival films before. We’ve seen one man survival films before. We’ve seen one-man survival films in the snow before. But there’s something about “Arctic” that makes it feel special despite that level of familiarity. Starring only two actors with minimal dialogue and characterization, “Arctic” is a film stripped down to its bare essence, allowing the audience to be taken on a grueling and realistic journey that highlights the endurance of the human spirit. The story opens up on a nameless character played by Mads Mikkelsen, in the snow, digging and shoveling. For what reason? We don’t know. We do come to realize that his plane has crashed and right away we are eased into the patient storytelling by Joe Penna as we feel every success and failure for the unnamed character. We don’t know how long he’s been out in the middle of nowhere but we know it must have been for a long time for the camera reveals that he’s digging a huge “SOS” sign into the snow for any nearby planes who might be able to rescue him. One finally does fly over in an attempt to rescue him, however, it too crashes into the snow due to the unpredictable weather, with the pilot dead and the only other survivor, too injured to go on her own (Maria Thelma Smáradóttir). Tempted to leave her to die but with a feeling of debt and sympathy, the unknown man takes the unnamed woman to his crashed plane and saves her life before deciding to embark on a dangerous and arduous trek through the Arctic in hopes of seeking rescue. Or otherwise, whether from the cold, the geography, the animals or from running low on supplies, the two strangers face certain death. Penna grounds his story deep within reality. There are no giant set pieces or scenes with CGI creatures made to look interesting for the trailers in an effort to sell more tickets. Here, the dangers feel so authentic and believable, filled with tension and powerful moral dilemmas that constantly keep the audience engaged throughout, all the way until the film’s tearful final moments. It’s also probably the best film since “The Revenant,” to display what true cold actually feels like on screen. It’s harsh, grueling, chilling and yet empowering due to Mikkelson’s strength in the face of such brutal conditions. “Arctic” is an agonizing experience that is worth the journey. Bundle up.